Hi y'all! I seriously meant to post a Teaching Tip yesterday, but life got in the way. Tell me it happens to you, too, right? This has seriously been the LONGEST week EVER (and it's only Wednesday!) I have a lot to share about this week though, so I'll be back to post tomorrow! I have to get things ready for HALFWAY DAY for my kiddos tomorrow. It's amazing to think that we're halfway through the school year already!!! If you'd like to celebrate HALFWAY DAY, you can find the unit I use here. Oh yeah, and while you're there be sure to follow TC on TpT....there's a little giveaway happening here that you might not want to miss! Today, I have a fantastic blog to showcase. Anne from Looking from Third to Fourth is a fabulous new blogger. She just started blogging in November, but she has some really great ideas to share! 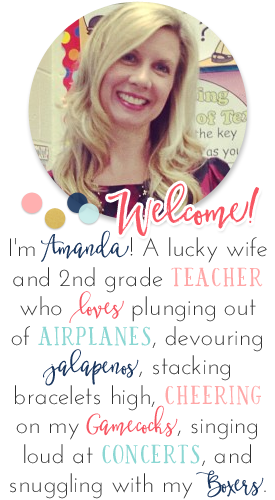 You must hop on over to her blog to see her newly updated blog desgin! Ah-dor-able!! While you're there, take a peek around her past posts, too! She has some GREAT book finds and the cutest Christmas ornament ideas to store for next year - oh, and that Christmas caroler art project - THE cutest!! I am from Ontario, Canada where I live with my husband, two daughters and our extremely cuddly and attention needing black lab Faith. I love reading, drinking Pepsi, stalking blogs and being with my family. I am currently teaching Grade 3/4. That is the grades that I have taught the most but for the last 3 years I was teaching Grade 2/3. I teach in a very small rural school and have only had a straight grade twice! This means that I usually teach the kiddies for two years in a row - but because of the change in grades will now be teaching them for three years in a row. When I moved down to 2/3 I started searching online for resources and that is how I became addicted to Pinterest and blog stalking. I have been teaching for 14 years. I started in a behavioural school attatched to my current school, moved to the regular school and haven`t moved yet! I can`t say that I have a favourite subject to teach but I love to teach using picture books - no matter what the subject is. If you popped into my class you would see books, books and more books. Me and my local library are very close friends : ). I have been known to take out 40-50 books to match our learning and classroom themes and to inspire the kids to read more. Hopefully you would also see a learning goal and success criteria posted as this is a big goal for me this year. I have two very good friends that I have been working with since the very beginning and they are what get me through one of those days - they have been there for them all!! The teaching resource I love the most in my classroom is my Brightlinks projector. I love how engaged the students can be with it and how helpful it is at the spur of the moment (like when we were reading 'The BFG' and the students wanted to see Buckingham Palace so we Googled images of the Palace and ta da the story became a little easier to visualize). I love teaching in themes and having a big celebration day at the end. I love when you can tie reading, writing, math, art and even gym into one theme. My primary teaching buddy and I have planned some great units and celebration days. Some of my favourites include the standards: 50'S Day, 100 Day, Dr. Seuss Day, Charlie and the Chocolate Factory, Polar Express but my favourite has been our Harry Potter Day. From having an E.A. secretly toss their invitations to Hogwarts in through the window, to seeing them all in gear and running through the wall (butcher paper on metre sticks that we moved at the last minute! ), to making potions, it is one day where there are nothing but smiles and the kids remember forever. Big themes, little themes, I love them all! My blogging goal for this year is to give back to the Bloggging community that has given me so much (inspiration and freebies!). I hope that a teacher goes to school one morning feeling relieved or excited to be using something she/he got from my blog. 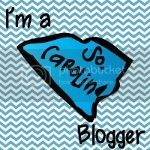 Thanks for featuring budding bloggers:) I am new and it makes me feel awesome to be able to find new people and follow them. I know how wonderful it feels to have that followers number jump! Love your blog and all of the great posts you contribute. This showcase is always fun to see! What a great idea - halfway day! I have to also agree with the other bloggers and posts before me by saying...Thank you for making us new bloggers feel welcome. It is kind of scary stating something new. 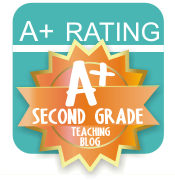 It is nice to know that there are teachers in the blogging community that are so welcoming. Love your blog!!! Thanks for sharing new and fab blogs with us.